The backroom of the Cafe Mussian is not Tardis and does not send them back to the French Revolution. There not sexual allusion in, "Well COURFEYRAC, do we have all the guns?" Les Misérables is not sung in remix ( http://www.youtube.com/watch?v=xxtcQKZwn3E ). In the Spanish version of Les Mis, Javert is not "Inspector Javier"
Therefore, Valjean is not Juan Valjuan. ...pressure R into asking about the contents of the back room at the Corinthe. ... ship any of Les Amis in the presence of any of them. @ souslesetoiles: What do you mean the back room isn't a TARDIS? I'm very sad now as I was hoping that it would actually send them forward into... let's say 21st century Illinois where I would be conveniently waiting Anyway, this may give me ideas for ridiculous fanfiction crossovers that I may or may not write. Vive la France! Vive l'avenir! Mlle Patria wrote: @ souslesetoiles: What do you mean the back room isn't a TARDIS? I'm very sad now as I was hoping that it would actually send them forward into... let's say 21st century Illinois where I would be conveniently waiting Anyway, this may give me ideas for ridiculous fanfiction crossovers that I may or may not write. I think Javert is a time lord ( But he doesn't know that. Kind of "John Smith". It may explain his love for the stars). --I will not introduce Grantaire to slashfics. --I will not tell Éponine that no one likes her. --I will not tell Cosette that no one likes her. --I will not tell Marius that no one likes him. --I will not follow Javert everywhere and add “...And the Lawr is not mocked!” to the end of everything he says. --I will not insult Poland in front of Feuilly. --I will not call Combeferre “Four-eyes”. 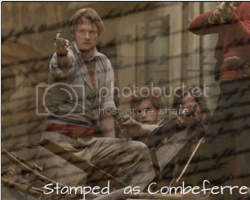 --I will not call Combeferre “Four-eyes” in front of Enjolras. --I will not make a bet with Courfeyrac that he can go out with every girl in Paris in less than a month. --I will not participate in any form of drinking game with Grantaire. --I will not tell Fantine that I preferred her with long hair. --I will not bring stray cats to ABC meetings, no matter how funny the Amis’ reactions are. --I will not tell Marius and Cosette that everyone skips “A Heart Full of Love” cos they want to get to the fun revolution bit. --I will not tell Enjolras that he and Grantaire look cute together. --I will not tell Grantaire that he and Enjolras look cute together. --I will not call Valjean a pervert behind his back. --I will not introduce the Amis to any form of social networking site. --I will not introduce the Amis to Molotov cocktails/petrol bombs/hand grenades, even if these will make sure they win. --I will not sing “Gee, Officer Krupke” whenever Javert turns up. --I will not give Grantaire the key to the wine store. Last edited by Mlle_Alexandrie on Thu Jan 05, 2012 3:43 pm, edited 2 times in total. --I will not cause traffic accidents just to watch Valjean perform feats of strength. --I will not try to convince Gavroche to steal Javert's hat. --I will not tell Marius to man up. That is Enjolras's job. --I will not steal the Flag of Freedom. --I will not steal the National Guard's loudhailor. --I will not treat the barricade as a jungle-gym. --I will not leave a French-translated copy of 'Das Kapital' anywhere where Enjolras might stumble across it. --I will not yell in Grantaire's ear to wake him up after a drinking session. The likely outcome will be a punch, a curse, a vow of vengeance or all three. LastAmi wrote: --I will not yell in Grantaire's ear to wake him up after a drinking session. The likely outcome will be a punch, a curse, a vow of vengeance or all three. Last edited by Mlle_Alexandrie on Thu Jan 05, 2012 9:37 pm, edited 2 times in total. --I will not shave Javert's sideburns while he is sleeping. --I will not call Enjolras a chicken because he wouldn't kill Javert straight away. --I will not give Jehan nightmares by telling him the story of the Ghost who lives under the Paris Opera House. --I will not introduce the Les Misérables characters to the concept of detention. --I will not force anyone from Les Mis to watch any movie adaptation. --I will not mention this thread to anyone from Les Mis. --If I do, I will not complain if they make a copy and hold me to everything that's been said. @souslesetoiles & Enjolras_the_Jaw: whoops! Sorry guys. I don't know how I managed that one. I guess I need to read more carefully. -I will not ask Éponine how the weather is. -I will not refer to Marius as "Pretty Boy Pontmercy"
-I will not give Combeferre a pair of hipster glasses. -I will not tell Les Amis about the similarities they share with the Sailor Scouts from Sailor Moon, such as having a fair-haired leader, the fair-haired leader's right hand being a nerd, having nine members (plus the one quasi-member! ), being defenders of justice, and having just the right amount of homoeroticism. -I will not ask Cosette why she decided to go blonde. -I will not introduce Courfeyrac to Cosette. -I will not introduce Enjolras or Feuilly to Hetalia: Axis Powers or Scandinavia and the World, lest they become a little too emotionally invested in cutesy cartoon personifications of their favorite countries. -I will not tell Valjean and Fantine about the opening to the 2009 Oscars. -I will not have a "who is the worst hypochondriac" contest with Joly. -I will not ask Enjolras who does his hair. -I will not as Bossuet who does his hair. --I will not show the Amis the Disney Robin Hood. --I will not tell Joly that ‘stickittodamaniosis’ is a type of rare disease that is contracted by people with non-yellow skin. --I will not laugh when Joly turns up to the next ABC meeting having painted his face yellow. --I will not take advantage of R's drunken state by convincing him to do the Macerena. --Video cameras weren't invented in the 1800s. Therefore I will not capture aforesaid Macerena on tape and use it as possible blackmail material.